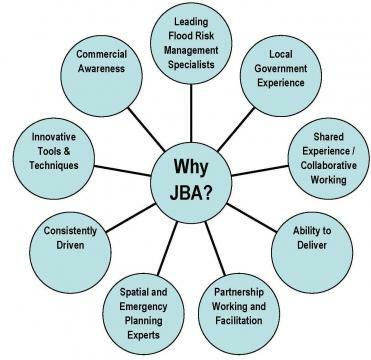 JBA is at the forefront of Flood Risk Management in Ireland and has assembled a team of specialists in Flood Risk Management with the ability to work along side developers and local authorities providing expert services. JBA bring experience of completing Flood Mapping Studies, Flood Risk and Management Strategies (FRAMs), Strategic Flood Risk Assessments (SFRAs), Catchment Flood Risk and Asset Management Plans (CFRAMs), Flood Risk Assessments (FRAs) and detailed understanding of land use planning to each and every project. JBA Consulting, was in fact established in Ireland in 2007 on the foot of writing the Developing Planning Guidelines for Flood Risk Management for DoEHLC. So it could be said that JBA 'wrote the book'! Let us help you with your Flood Risk Assessment or Design/Delivery of Solution.